Our hotel fire training London course and fire training for hotel staff sessions are for managers, front of house, receptionists, catering and also maintenance crews. This programme can be changed to include your own hotel plans. Our hotel fire training London programme can be on-site at your premises. We place no limit on the numbers attending this course, so all your staff could attend this training. Persons on the hotel fire training London session and fire training for hotel staff sessions will receive a training certificate and also online training notes. What will my tailored hotel fire training London course include? Since your own course will follow our base programme, we can change the following sessions: Fire extinguishers – we will talk about classes of fire but also talk about the types of extinguishers you actually have in your hotel and how they operate. We will discuss your fire emergency plan if you have one and can also include pictures of actual risks in your workplace. We will talk about day and also night procedures that you have prepared. Finally, we can talk about specific disabled guest plans that you have in place. This course is a three hour programme but we can shorten it so that we fit in with the daily routines of your hotel. Booking a hotel fire training London programme is so easy. Either call us or email us with the date you want. It may be a good idea to also gives a few other dates too! We will ask for some details and ask you to agree out terms and conditions. Once we have them, your course is booked! 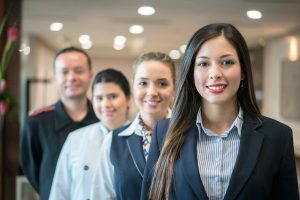 Fire training for hotel staff – How many can attend a session? Our fire training for hotel staff sessions can be attended by any number of persons. If you opt for a session with live fire training exercises, we limit the number of persons tackling fires to about twenty. Fire training for hotel staff – How many fire wardens and fire marshals do we need? All persons in a hotel may have duties in the fire evacuation plan. Our fire training for hotel staff sessions are ideal for all persons working in a hotel. We cover accounting, evacuation, fire emergency plans, hazard spotting and also the need for deputy fire marshals or wardens.